As I said in Currently Reading, the first page of The Catcher In The Rye amused me so much that I strongly felt it had to be my next read! Certainly, I found the first few chapters pretty funny, but then it kind of lost that charm with me. Here's why. The protagonist is Holden Caulfield, a rebellious, alienated 17 year old boy living in 1949. The book is written as if Holden is talking to us, the readers, as friends, while he explains the accurances of the first few days after he flunks out school for the fourth time. Along the way we discover the inner workings of his mind as he describes his family life, the schools he went to, his academic record, love interests, and brief conversations with strangers. Holden is most definitely a cynic. That's given away on the first page. In fact, the first page pretty much sets the tone for the entire book. Here you get a good introduction into the kind of language that is used; language that would have been very controversial when it was first published in 1951. There are plenty of swear words! Okay, so nothing that we would constitute as swearing today (at least not until the last couple of chapters of the book), but I guess they would have been back in those days. Some of the themes are also quite controversial. For instance, without giving too much away, Holden has an encounter with a prostitute. Yeah. That definitely would've hit some kind of mark back then, and perhaps even today. There are a few other risque subject matters but I won't go into those incase I ruin it for you fine people. Let's just say that it doesn't go too overboard for our 21st century world, but it would have done for the mid-20th century world in which it was written. Anway, I enjoyed the general story. It was easy to follow, but not in a way that made it particularly dull. What I did dislike was the repetitive language J.D. Salinger has given our lead, and this is what tainted the book's initial charm for me. Holden tends to use the same words to describe everything - I lost count of the amount of times he called people 'phony' or 'lousy' or described his mood as simply 'depressing'. He also uses the same phrases a lot, such as 'I really do', 'that killed me' and 'I'm not kidding'. It did quite annoy me, and so I stopped finding it funny after about the first three or four chapters. 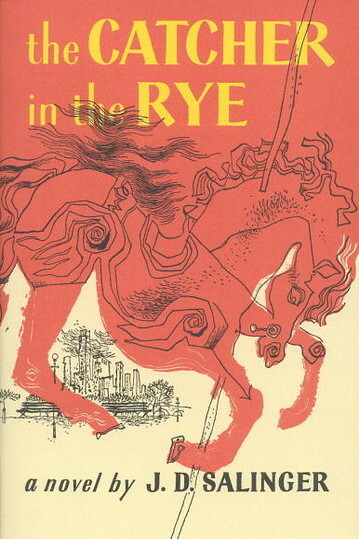 It would've entertained me much more if Holden was given a more diverse dialect, but I guess that Salinger wanted to emphasise the fact that he is just a teenager who honestly doesn't 'give a damn' about anything or hardly anyone. But don't get me wrong. This book doesn't depress you, even if it is quite obvious that our protagonist is unhappy with his life. It is a somewhat dark tale that is told with a level of cheeriness. Am I making sense? It is quite a complex book, even if the dialogue is straightforward. I really think that whoever reads this book could get a lot out of it. I myself found it very possible to identify with some of the moods and observations Holden has. I say give The Catcher In The Rye a chance, especially if you enjoy reading young adult novels. It's easy to see why this book appeals to people of that demographic even today; J.D. Salinger has definitely encaptured the world of teenage angst in a way that trancends time. I loved this book when I was a kid, and I loved it again when I read it a few years ago. I made both of my sons read it and they liked it, too. Catcher in the Rye is a timeless coming-of-age story, built to last.